Ever had those days when the fish won't take a popper or moving surface fly? Here's the answer: Dead drift or slightly twitch one of these proven hopper patterns and hang on! This exclusive Hopper selection can be used anytime of year, but especially when the water warms in June through September, in many parts of the country. These flies are intricately tied and the most durable flies I have ever used! Slip a set of these in your tackle bag the next time you're fishing with "Mr. Know-It-All" or "Mr. Been-There-Done-That" and watch 'em drool! 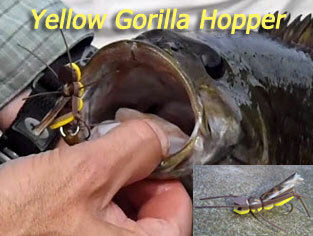 These hopper patterns can double as super dragonfly, cicada and other large critters to drive fish nuts. I used one hopper popper last summer and took 17 smallmouth on it and it's still alive, minus a few legs! That's what your are paying for: durabilty and effectiveness. These would cost over $4.00 each in the fly shop - if they carried them, which they don't. These hopper patterns will float all day unlike hair patterns, and the hi-viz tabs add visibility, even in the worst conditions. 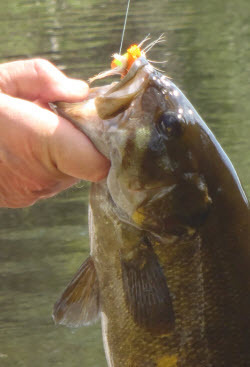 I've hand picked the best six patterns after extensive use during the summer of 2011. These are also the ultimate dropper fly point fly. We used them in high and low water, fast and slow, clear and murky - and they worked better than traditional poppers on many occassions. You'll recall those days when poppers don't work. You automatically go underwater, right? Here is the missing link. You can still enjoy top water action with out having to "chuck and duck" all day. The container makes a nice little fly box by itself, keeping the flies fully fledged - ready for action! My buddy used them on a guided trip last summer on the Mississippi when the all-knowing guide was striking out on his traditional poppers and streamers. Needless to say, the guide will be packing some of these beauties next summer and he'll quickly remove off his customers tippets and sock them away at journey's end. Oh, by the way, the bass voted and it is unanimous! Do you want 'em even bigger? Yep, we got 'em! How about a Twin Pack? 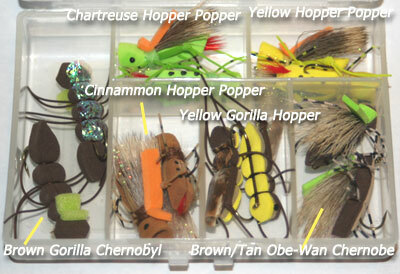 New Bass Flies - Hoppers! Got several strikes with this interesting looking little bugs. I really like the twitching action they make on top of the water. Here's what I caught the first day using the Brown Gorilla Chernobyl Ant. an 18" and a 18.5" bruiser! Thanks for the great flies! Just received this great hopper selection. Each one looks very well made, durable and very "fishy". 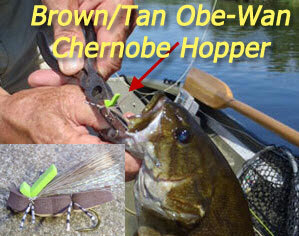 Can't wait to try them out on smallies when I get up to Maine in early June.